KTM has been READY TO RACE for more than six decades. In the mid-1950s, Erwin Lechner went from victory to victory on the “Apfelbeck-KTM”, and in the late 1960s, the start of series production of offroad bikes marked the beginning of KTM’s journey into becoming the global market leader in offroad models for years to come. As early as 1974, KTM bagged its first international title win. Gennady Moiseev from the then Soviet Union won the first motocross world championship for the Mattighofen-based manufacturer, and Imerio Testori from Italy became European Enduro champion in the 500cc class – the Enduro world championship having not yet been launched. These were two titles that would be followed by countless others over the years. 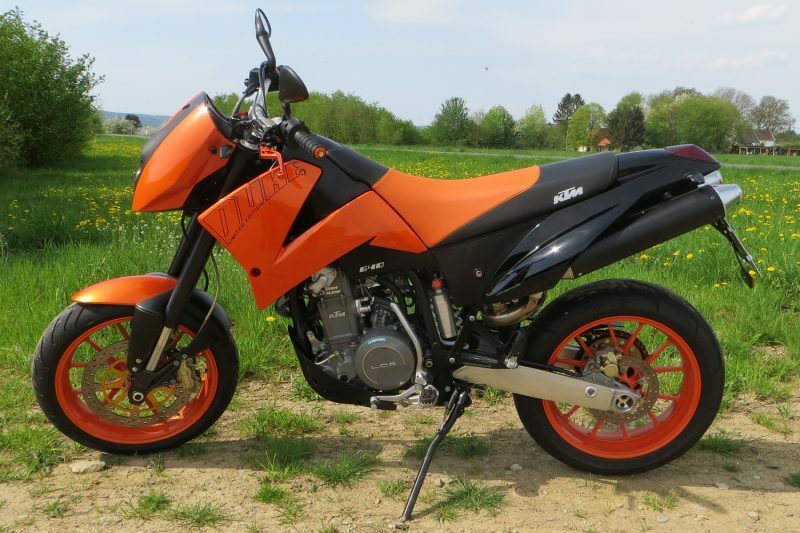 In 1992, KTM was under new management following the insolvency of the former KTM Motorfahrzeugbau AG, meaning that the R&D department was devising new concepts for the future. Just two years later, the range of offroad bikes was expanded to include the KTM 620 DUKE – a street version with a powerful LC4 single-cylinder Enduro engine. KTM has manufactured both offroad and onroad machines ever since. However, the KTM 620 DUKE, which was designed as a “fun bike”, was not produced in high volumes in order to close the gap with major industry players. As long-distance touring was the fashion of the time, it made perfect sense that Wolfgang Felber, who was head of R&D at the time, entitled the next project “All Terrain Enduro” – a twin-cylinder machine for long-distance touring bikers that could be used both offroad and onroad. In fact, there had already been some talk of getting ready for the future some years previously. A V2 engine with two 553cc LC4 cylinders was produced in collaboration with Jens Polte from Darmstadt, who is known for his racing achievements at the “Battle of the Twins”. This monster promised power in abundance. Those responsible for the “All Terrain Enduro” project also opted for a slim twin-cylinder V-engine, which offered considerably more possibilities than the tried-and-tested LC4 single-cylinder motor. The 60 mm short-stroke design provided for a low construction height, while the cylinder angle of 75° ensured compact dimensions. Called the LC8, the V2 engine delivered a good 100 hp from 950cc by the time the KTM 950 ADVENTURE concept bike was presented in 2000 at Intermot in Munich. At the 2002 Dakar Rally, Fabrizio Meoni was the first to cross the Lac Rosé finish line in the Senegalese capital on the rally version of the KTM 950 ADVENTURE. 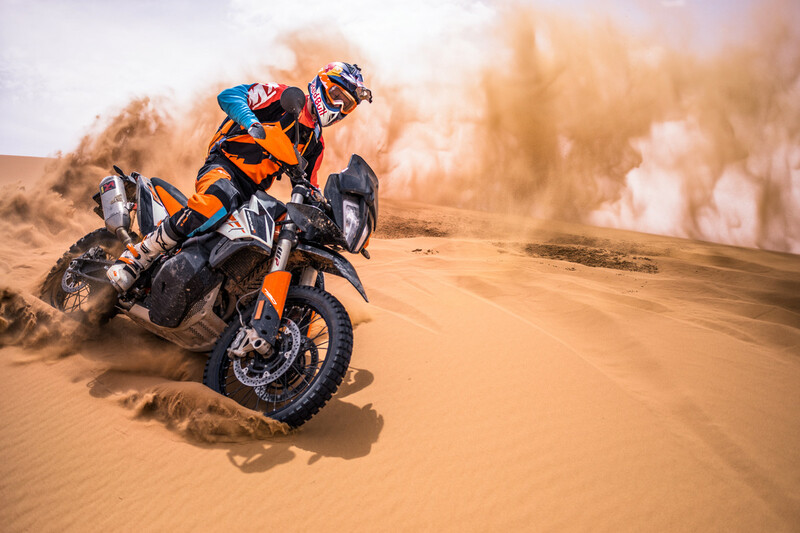 This was the second KTM victory at what is probably the most popular motorbike rally in the world – a distinction unmatched by any other manufacturer to date. 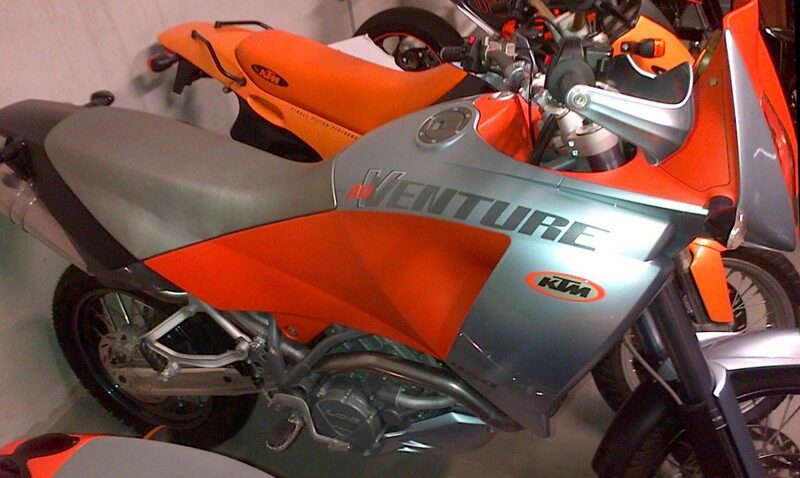 The introduction of the KTM 950 ADVENTURE onto the market followed in 2003, the year of KTM’s 50th anniversary. By the time KTM introduced the KTM 990 DUKE concept bike at the EICMA in autumn, it was clear that KTM did not wish to surrender the large-volume street bike segment to its competitors. However, the developments did not represent a departure from the offroad sector – quite the opposite in fact. With the LC4 Super Competition having previously raised the bar for 4-stroke engines in Enduro and motocross races, a second range of 4-stroke racing engines (starting from 400cc and 520cc) then went into series production. Alongside the move to the new factory building in autumn 1999, production of the EXC-Racing and SX-Racing models – which were intended exclusively for competition use – began. The LC4 motor was also further engineered – with an increased displacement and now called the 640 LC4, it was most powerful single-cylinder series engine in the world. It was used in various Enduro and Supermoto models and also in the KTM 640 DUKE 2, which is still hailed as a “design masterpiece” by some journalists today. For KTM, the days of only being able to identify a motorbike by the brand logo on the fuel tank were long gone. The legendary Mint & Pepper models from the early 1990s are still remembered by many owing to their extravagant colors, but somehow they did not succeed. Great success only came several years later when KTM turned orange. At the time, Gerald Kiska, a young designer to whom the KTM design contract was awarded, and who has been responsible for the distinctive KTM design ever since, was in agreement with KTM CEO Stefan Pierer that all future models should be recognizable at first glance. The original orange color was refined further, and in the world of motorcycles, “KTM Orange” soon became the equivalent of “Ferrari Red” for cars. This not only applied to the paintwork on the motorbikes, but also to the entire brand image – from letter paper and trade show stands through to dealer showrooms. In the late 1990s, Kiska perfected the topic of “Edge Design” for KTM, which had become popular in the automotive sector. To this day, all KTM motorcycles bear the hallmark of Kiska’s unique handwriting style. And long before anyone ever thought of LED signatures, the KTM DUKE 2 was immediately recognizable as a unique KTM model even from the rearview mirror. The reason for this was the two ellipsoid headlights one above the other; a unique styling element in the motorcycle sector. Over the years, KTM did not produce any more bikes with two adjacent headlights, let alone one above the other. Even today, a DUKE or ADVENTURE is still recognizable at just glance thanks to its typical “face”. 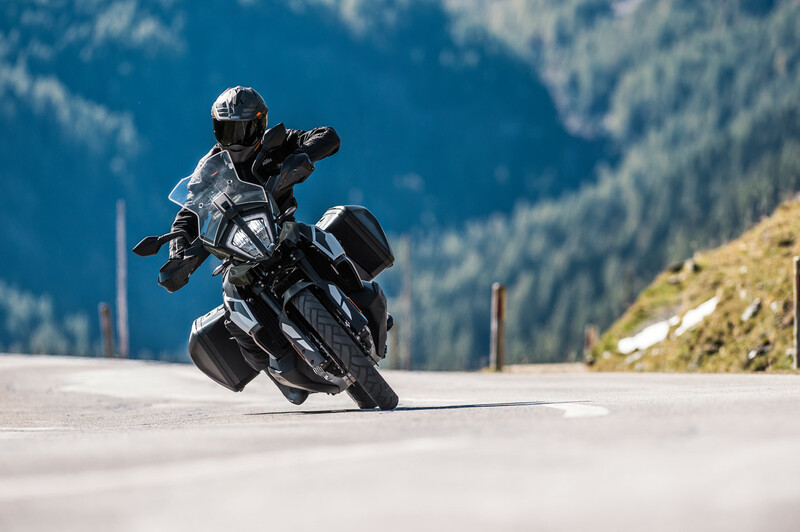 Twenty years later and things have come full circle at the EICMA – two decades after the first multi-cylinder concepts, the KTM 790 ADVENTURE (in two versions) with the compact LC8c motor complements the mid-range class in the Travel segment. And just like the one-time “All Terrain Enduro” project, the bike is well suited to adventure tours and offroad voyages of discovery on tough terrain.